A warm, creamy bowl of pumpkin spiced oatmeal is a great way to start your morning! High in fiber and heart healthy whole grains, this breakfast will fill you up and keep you satisfied until lunch. More of my favorite ways to get in a hearty oatmeal breakfast is with Baked Oatmeal with Pumpkin and Banana, Strawberry Rhubarb Baked Oatmeal and even Oatmeal Smoothie. I love the convenience of overnight oats in a jar, but today I was craving a warm bowl of oatmeal just like Mom used to make. She made the best oatmeal when I was a kid, it was so creamy (made with whole milk) and she always cooked it with cinnamon sticks. I tried to replicate the creaminess using a blend of almond milk and water to keep it light and the results were wonderful. Topped it with homemade pumpkin butter, skinny pumpkin granola and a pinch more cinnamon and pumpkin pie spice… heavenly! If you’ve made pumpkin granola, it’s the perfect topping to add a little crunch. If not, you can top it with a few dried cranberries and chopped pecans or pepitas. Enjoy! Cook oatmeal in almond milk and water along with cinnamon (you can add a cinnamon stick too) and pumpkin spice according to package directions. Pour cooked oatmeal in a bowl and top with homemade pumpkin butter, skinny pumpkin granola, cinnamon and pumpkin pie spice. I have to know, what type of oatmeal do you use? I made this the other day and mine just does not look as good as yours does. lol Yours is whiter and creamier, like the oatmeal I tend to stumble upon at restaurants and absolutely love, but cannot seem to duplicate. 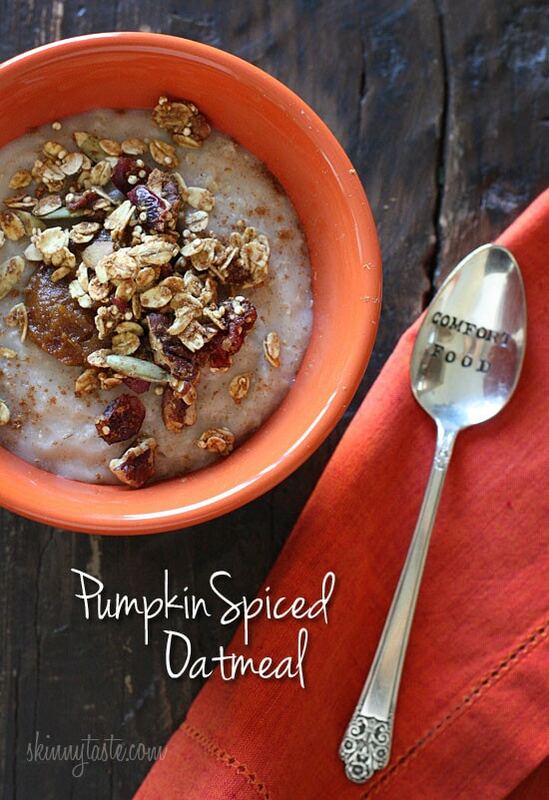 Love oatmeal and would like to make this but…..not a fan of pumpkin, is there something else I could use instead of pumpkin? what is one bowl? 1 cup? 11/2 cups?? What size serving is considered to be a bowl, ex:1 cup, 1 1/2 cup? Had this for breakfast and liked it. It was so filling I couldn't finish mine! ? Yummo, I have never seen pumpkin spice i the shops before here in Aus. Will look out for it now! 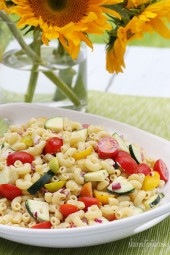 Made this this morning, quadrupled the recipe to feed our family and it was amazing! My husband said "this is GOURMET oatmeal!" Soooo creamy! Love all the textures that happen in your mouth with all the toppings. Definatly a keeper! Can't wait to try this! YUM!!!! I have been looking for more healthy breakfast alternatives, and this looks absolutely delicious! Can't wait to try it out. Thanks for the recipe. Silly question… But where do you get those cute spoons?? I made this this morning and blogged about it, linking you back. Thanks for the recipe. It was great! I made pretty much the exact same recipe except I added in 1/4 cup of pureed pumpkin (canned). I didn't have pumpkin granola or pumpkin butter, but I did top it with pecans, which was really good! I also add in some vanilla for flavor. I love trying different combinations of ingredients. I can't use any nut milk or dairy milk, I'm allergic to them. Can I use water instead? Are these quick oats, regular ones, or steel cut? Does it matter? Thanks! Try a hand full of pomegranate arils in your oats. That burst of juice as you break open the arils with your teeth! Yum. Last winter, I made pumpkin cranberry oatmeal just about every morning. I used 1/2 cup of oats and then 1 cup of water and 1 cup of unsweetened almond milk (lots of liquid but the oats do absorb it all if you allow it to simmer long enough; and makes for a huge bowl) and full of warm spices. Just add in a 1/2 cup of whole cranberries while cooking and they soften and burst and so much tart flavor. I then finish it off with a little maple syrup and 1/2 tbs of peanut butter. Does the calorie count also include the two toppings? I was enthusiastic about the almond milk until I noticed that it doesn't have the protien that skim milk has. ooh! the perfect fall breakfast. warm & spiced …so cozy! looks like a perfect 'stick to your ribs' kindof fall breakfast! 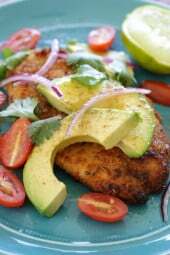 This recipe looks so delicious and perfect for fall!! I'm loving all this pumpkin spiced stuff! Going to try this one soon! Una ricetta bellissima per una colazione piena di energia e gusto! Me too, I love cow's milk too, but I use them all for different reasons. Hi Gina, great post! I have a really silly question – where do you get pepitas? I was in Giant and looked in produce and couldn't find them… have you found them in regular grocery stores or would I have better luck at a Trader Joe's? Oh, and I'm so excited for your cookbook!! I always buy them in Trader Joes! Now this is my kind of breakfast! Sign me up for a pumpkin spiced bowl of comfort food… Great recipe! 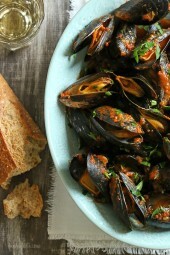 This look SOOOO delicious! Thanks for sharing! I make a similar version with canned pumpkin, protein powder and a bit of almond butter to keep me fuller longer – but I never ever get sick of pumpkin-flavored oats! Oh wow! This sounds delicious! I made something similar to this over the weekend using your overnight pumpkin oats recipe as a template. It was wonderful (as usual), and I can't wait to try this recipe out! Thanks for all the wonderful healthy ideas! Oatmeal is my favorite breakfast food to play around with so I love this addition of pumpkin! Yum! I can't wait to try this! Thanks for the recipe!